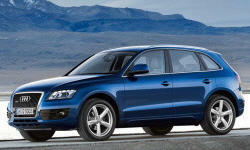 Why the 2012 Audi Q5? The first thing most of us see that attracts us to a vehicle is its styling. Among small, luxury SUVs the Q5 stands out as among the most attractive. I liked the older X3, but not the new swooping curve model. The Q7 seems portly to me; the Q3 truncated. Many like the 2.0 turbo, but I have many bad memories of turbo lag and wasn't willing to take a chance. Oil consumption was a minor point and reports that reported gas mileage for the 2.0 is not that much better because you have to push the 2.0. The V6 Q5 I drove at the dealer had ideal handling: firm, responsive, quiet ride. A 10 day blast through southern Germany, Switzerland, and northern Italy after factory delivery only confirmed this, even at break in speeds. After suffering the droning of a Honda Pilot for 5 years I was ready for quiet and the Q5 delivers. As many report, Audi's interiors are among the best and the word to describe the Q5's is sumptuous. Why Not the 2012 Audi Q5? I worry about escalating gas prices here in CA, but I got about 23 mpg in Europe and hope for that here. Not great, but close to the turbo and if people push the turbo to make up for the lesser power, as I would, the mileage is a wash.
Just after I put down my money for European delivery and Consumer Reports "worst reliability" came out for the V6. This web site reassured me about the cause of the report, the plastic housing water pump, that no longer comes on the V6. The Q5 is not cheap. I wanted what the Q5 has and I hope over time I'm pleased with having paid so much. There are none. European delivery offers a 5% discount, one night's free hotel, as the food you can eat at the Audi restaurant, and an amazing tour of the factory.For that you then have to wait two months to get your vehicle after dropping it off. Even in car crazy CA, Audi dealers don't seem to know their product and are used to uninformed and undemanding clients. I usual know more about a car than the salesman, but for $50G you'd think not.